I’ve got a nasty bruise on my left palm, just below the index finger. The tendons in my hand and wrist ache like previously-broken bones warning of a change in weather. My right thumb is developing a callous. Oksana bought me a PlayStation 2 with Guitar Hero II for Christmas. As cramped up, clawed over, and carpel-tunnel destined as my hands are right now, I still have to will myself away from the TV long enough to write down my thoughts. Guitar Hero II is an instant addiction and I want another fix. I’d never even seen the original Guitar Hero played, let alone picked up one of its flimsy-looking, plastic controllers. But Penny Arcade’s, Jerry Holkins kept preaching the virtues of rock, and when a game magazine’s editor decided a comment on it was worthy of a place in his parting words of wisdom (“Guitar Hero really is as good as everyone says. If you haven’t played it yet, do so.”), I started dropping hints for Santa. The game is slightly more expensive than most new PlayStation games if only because it comes bundled with a game controller shaped like a miniature guitar. A first blush, it doesn’t look like much. Five colored buttons adorn the neck and make up the “frets.” A simple rocker switch in the middle of the body is your “strum bar.” There’s also a whammy bar and tilt sensor hidden inside. It looks cheesy as hell. One wouldn’t think you could rock out on such a clunky piece of plastic. One would be wrong. The game has a built-in tutorial where a suitably grungy voice walks you though the play mechanics. While the screen shows you an animated guitar neck, colored “buttons” that correspond with the colors of your frets appear on the screen and slide down toward you. In this way, it’s a lot like Tetris; you can see with your peripheral vision what comes next. When the buttons reach the bottom of your screen, hold down the proper fret and “strum” your bar. If your timing is right, you’ll hear the note play just like it would be in the song. Miss the timing, hold down the wrong fret, or forget to strum, and an annoyingly discordant sound will play instead. All you need to do is keep up with the colored notes as they scroll down the screen. You’ll start on Easy mode. It’s easy because it only uses the first three frets and almost never throws a chord at you (chords are where you need to hold down two frets at the same time.) I beat Easy mode on the first night. Medium mode comes next — I beat it in another couple days. Medium throws chords at you left and right, but the real devil is the addition of the forth fret. You will curse your weak pinkie. I beat Medium, but I’m not even good enough to practice on Hard mode, yet. A fifth fret? How the hell am I going to reach that? What’s insane is how well this game mimics playing a real guitar. When you’ve got a lock on the beat and your left hand begins to contort, naturally, into the shapes that actual guitar players use, it makes you fell like you’re really playing music. You’re not, of course, and if you put down the plastic toy and pick up a stringed instrument, you’ll see that’s true. But while you’re playing… man! There are so many little touches that make the game such fun to play. When you miss a particularly important power chord, the audience let’s you know. If you keep missing note after note, they’ll eventually boo you off the stage. But when you’re in the zone, when you nailing the notes in Sweet Child O Mine just right or when you’re hitting the end of the hilariously difficult outro of the Freebird encore, their cheers will propel you along. Even better, tilt your guitar’s neck to the sky, trigger the tilt sensor, and enter Star Power mode. The crowd will go crazy, you’ll hear them clapping along to your beat, and, of course, you’ll score double points! Warrant’s Cherry Pie rocks like the guilty pleasure it was. Rock This Town’s notes come so fast you’ll abandon the visual cues on screen and relish playing along by ear. And the drummer at the end of Spinal Tap’s Tonight I’m Gonna Rock You Tonight? Well, he explodes, just as he should. Next week our second controller will arrive and Oksana shall rock alongside me. 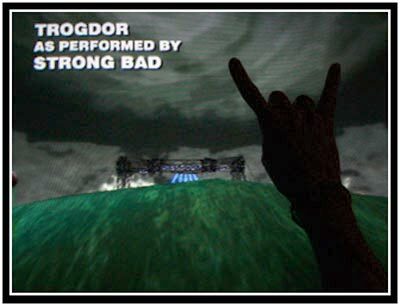 Tonight, I’ll shall unlock the Trogdor track.